Have you been struggling with your article pitches? Need a quick boost of tip advice to iron out the rough spots? 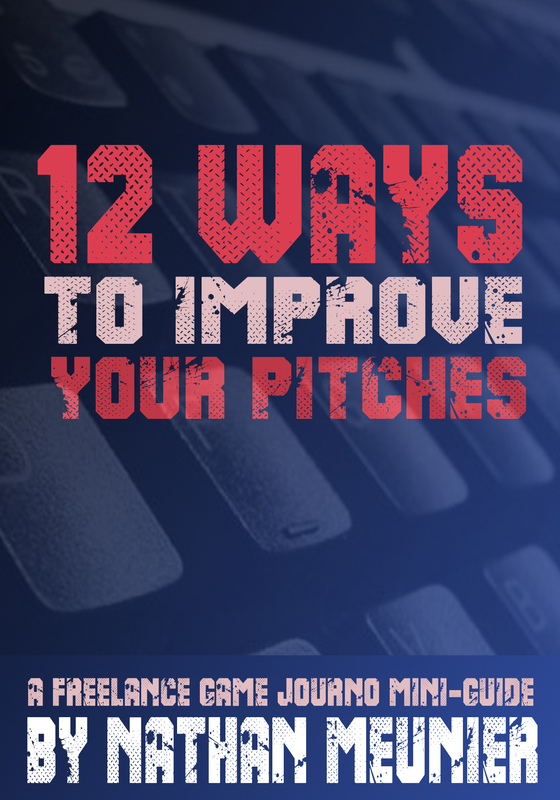 Check out my free 4,000+ word PDF mini-guide “12 Ways To Improve Your Pitches!” This handy ebook for freelancers and aspiring game journalists is available as a free download to anyone who subscribes to my Game Journo Guides mailing list! All you have to do is sign-up, and you’ll get an email shortly afterwards with the download link! Don’t worry, I only send out very sporadic mailing blast, so you won’t get inundated. Plus, subscribers get access to exclusive freebies, special offers, and advance news on upcoming game journo guide books I’m working on, like my next book: Interview Fu: The Game Journo Guide To Conducting Killer Interviews. This entry was posted in Freelance Game Journo Shop Talk, Shop Talk by nmeunier. Bookmark the permalink. My family members always say that I am wasting my time here at web, except I know I am getting experience all the time by reading thes pleasant posts.